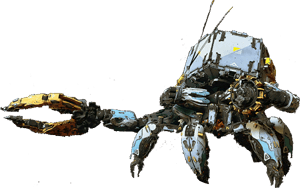 Shell-Walker is an Enemy machine in Horizon Zero Dawn. "Prioritizes protecting its cargo above all else, utilizing its energy shield and ranged Shock attacks." Crate Holder: Destroying component will detach the cargo container. Lightning Gun: Destroying this component disables the ranged Chock attacks. Power Generator: Destroying the power generator disables all Shock attacks, the shield, and triggers an explosion Shocking anything in the area. Shield Claw: Destroying this component disables the energy shield.